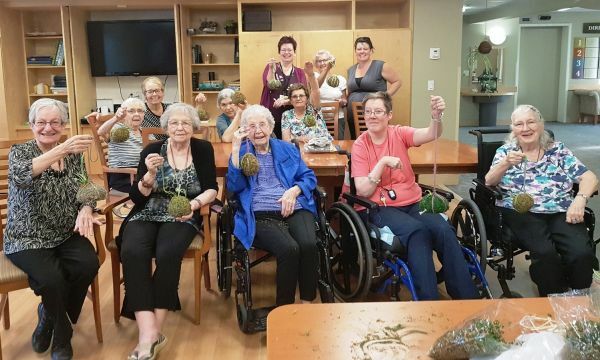 Resident crafters at Points West Living Wainwright were delighted – and admittedly curious – when General Manager Carli Lopez volunteered to lead them through making a kokedama. It’s part of a series of craft opportunities that combine learning about culture with hands-on creation. Once a month, usually on a Wednesday evening, a group of residents and interested family members gather to learn a new craft from either Shauna Lee Carlson (recreation coordinator) or Carli. They’ve already learned Norwegian weaving and made dream catchers. This was the first craft where they had to get their hands dirty to complete the job. Kokedama is a Japanese word meaning ‘moss ball’, and is said to be a cross between bonsai (‘tray planting’), kusamono (‘grass thing’), and nearai (‘no pot’) planting styles. It is made by mixing a combination of soils, gathering the soil into a ball, wrapping the ball with string, overlaying it with moss, and popping a little plant into the top. There are tricks to making it actually work, like Carli’s direction to wrap the soil ball in a square of fabric before winding the string around it. Even though each moss ball looks a little different, they all turned out well. Photo: (Back from left) Shauna Lee Carlson, Betty Peterson, Carli Lopez; (Middle) Kirstie Miller, her daughter Deb, Lorraine Lychak, Shirley Lusk; (Front) Rita Donaghy, Ethel McFarland, Olive Frissell, Shelley Donaghy, and Jean Belanger show off their newly made kokedamas.